In class we discussed a dynamic system that depicts the slope as rise over run. In our class example however, only the magnitude of the slope was able to be measured, and not the direction of the slope when it was negative. I found this graphic that takes into account both the direction and magnitude of slope based on the rise and run of the graph. In the activity we did in class, the rise and run were calculated from the line segment lengths of the rise and run. 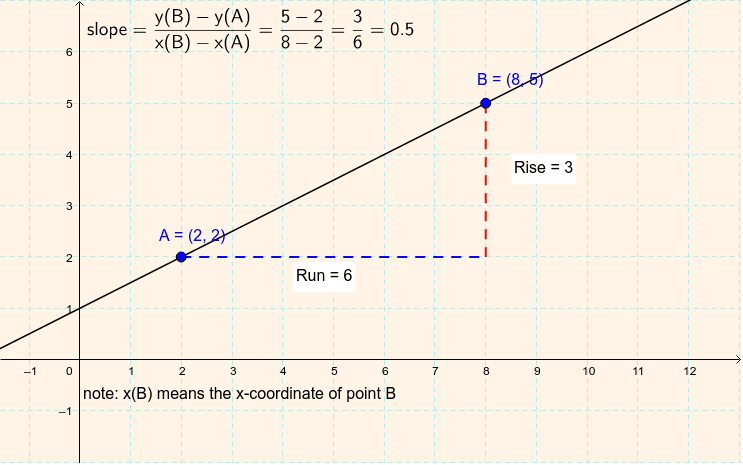 In the above example, the rise and run are derived from the y and x values at the points A and B and therefore dynamically change based on the operation of subtraction being performed. This graphic would be more useful for students as they can freely manipulate the points in any direction and get the actual slope with both magnitude and direction included. Using this graphic, they can make observations about when the slope changes sign/direction both graphically and algebraically.